With our Advanced PHP Selector tool (available to all of our Linux Shared Accounts purchased after September of 2013), every client is able to easily select a PHP version of choice, in addition to able to manage all PHP extensions, and basic PHP configuration options (php.ini changes). Say no to the messy configuration changes, and hands on dirty work! NOTE: If you have purchased hosting from us before September of 2013, please review this article on changing PHP version instead. 2. 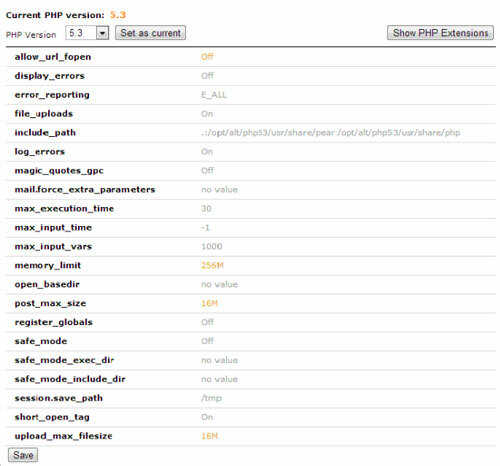 Once inside the tool, the first screen displays the current PHP version, which by default is listed as "native" (which is usually the most current/most popular PHP version). 3. Once the desired PHP version is selected, you will be able to pick any required for your applications PHP extensions. If you are unsure which extensions to select, we recommend that you check with your application developer/vendor, or leave the default set of extensions. It is important to be noted, that depending on the PHP version selected, different PHP configuration options will be available. For example "magic_quotes_gpc" will not be available for PHP 5.4/5.5 since it is removed as a feature from the latest PHP builds.